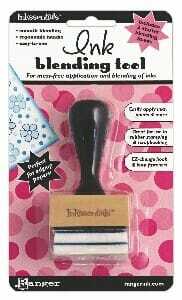 Ink Blending Tool. The Inkssentials Ink Blending Tool is an ergonomic solid wood tool which is ideal for precise application of inks and other craft mediums. Easily applies inks paints and more Allows mess-free application Easy foam replacement. Customer evaluation for "Ranger Ink - BS inkssentials Ink Blending Tool"